Home» » Maha Sankalpam Spell-1/Spell-2/Spell-3/Spell-4/Spell-5 Question Papers. Maha Sankalpam Spell-1/Spell-2/Spell-3/Spell-4/Spell-5 Question Papers. Maha Sankalpam Spell wise like Spell-I/Spell-II/Spell-III/Spell-IV/Spell-V Subject wise Scheduled wise Question Papers like (Telugu,English,Hindi, Urdu,Tamil & Mathematics,Physical Science,Biological Science,Social);AP Spell wise(Spell-1/Spell-2/Spell-3/Spell-4/Spell-5) Maha Sankalpam Telugu,English,Hindi, Urdu,Tamil & Mathematics,Physical Science,Biological Science,Social Studies Subject wise Question Papers Download;Maha Sankalpam Spell-I/II/III/IV/V Subject wise Question papers;AP Maha Sankalpam Spell-I/II/III/IV/V Subject wise Telugu,English,Hindi, Urdu,Tamil & Mathematics,Physical Science,Biological Science,Social Question papers. 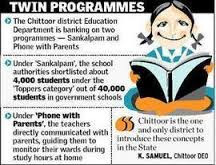 School Education Chittor District D.E.O ( District Educational Officer) Announced Maha Sankalpam Spell wise like Spell-I/Spell-II/Spell-III/Spell-IV/Spell-V Scheduled and Model Papers given below. School Education Chittor District D.E.O (District District Educational Officer) Announced Maha Sankalpam Spell wise like Spell-I/Spell-II/Spell-III/Spell-IV/Spell-V Scheduled for SSC Students Subject wise/Spell wise scheduled.Its useful to Examination efficiency and Preparation and Revision wise Scheduled to improve here examination skill efficiency. Maha Sankalpam Spell-1/Spell-2/Spell-3/Spell-4/Spell-5 Scheduled and Subject wise like Telugu,English,Hindi,Urdu,Tamil & Mathematics,Physical Science,Biological Science,Social Studies Subject wise Question paper given in below..
Maha Sankalpam Spell-I/Spell-II/Spell-III/Spell-IV/Spell-V Question Papers Download. School Education Department Chittor District SSC 2017 Maha Sankalpam Spell wise like Spell-I/Spell-II/Spell-III/Spell-IV/Spell-V Scheduled for SSC Students Subject wise/Spell wise scheduled given in below. Spell-I/Spell-1 Maha Sankalpam Subject wise Question Papers Download- Click Here. Spell-II/Spell-2 Maha Sankalpam Subject wise Question Papers Download- Click Here. Spell-III/Spell-3 Maha Sankalpam Subject wise Question Papers Download- Click Here. Spell-IV/Spell-4 Maha Sankalpam Subject wise Question Papers Download- Click Here. Spell-V/Spell-5 Maha Sankalpam Subject wise Question Papers Download- Click Here.